Ugali is to Kenyan cuisine what mashed potato is to the British except more widely eaten – i.e. with most meals. Ugali is similar to Southern Africa's Mealie-meal, Nshima, and Sadza. In West Africa it is called Fufu. It is usually made from maize (corn) which was brought from the Americas to Africa by Europeans. Previously it was made from millet. 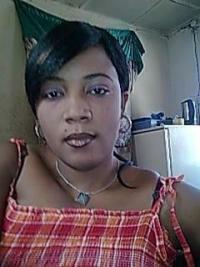 It is a starchy accompaniment for the African soup or stew or sauce, or other dishes with sauce or gravy. 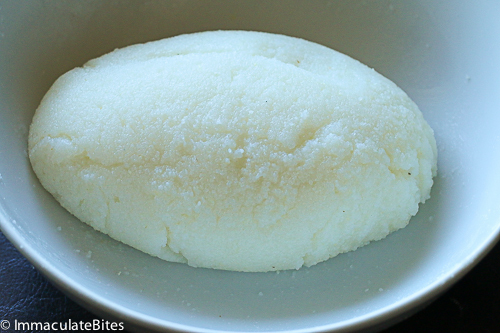 Ugali is generally made by boiling and vigorously stirring a starchy ingredient into a thick, smooth mush. Many Kenyans feel they haven't had a meal unless they have eaten Ugali with a sauce or stew. Heat water to boiling in a saucepan. Gradually pour ½ the corn flour into boiling water stirring continuously to avoid lumps. Stir continuously and mash any lumps that do form until boiling. Allow to boil for about 10 minutes stirring occasionally. Now for the hard work: Add more corn flour gradually, stirring continuously until it is thicker and drier than mashed potatoes – it should pull away from the sides of the pan Cook for three or four minutes, continue to stir. (Continuing to stir as the ugali thickens is the secret to success, i.e., lump-free ugali.) To serve, wet the inside of a bowl and tip the ugali into the bowl. For a really authentic look, immediately gently ‘flip’ the ugali so the bottom side is now up and it looks smooth. Serve immediately with any meat, or vegetable stew, or any dish with a sauce or gravy. It is often eaten with your right hand – break off a piece, roll it into a ball, make an indentation and scoop up the stew or sauce. 1 teaspoon salt (optional) 3 cups boiling water Serves 4 to 6 Put cold water in a medium-size saucepan, add cornmeal and salt, mixing continually. Bring to a boil over high heat, gradually stirring and slowly add 3 cups of boiling water to prevent lumps. Reduce to simmer, cover and cook for about 8 minutes, mixing frequently to prevent sticking. The ugali will be done when it pulls from the sides of the pan easily and does not stick. It should look like stiff grits. You can serve ugali with everything from meat stew to sugar and cream. Your choice!